Today we had a rest day. After saying goodbye to our student friend, who still had another day's walking to her village, and a lovely walk in the morning, we spent the afternoon pleasantly doing nothing. 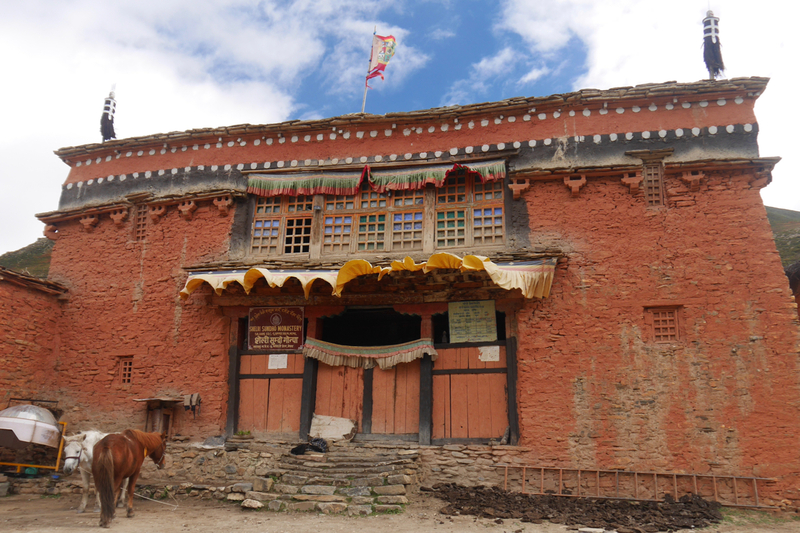 'Gumpa' means monastery and the Shey Gumpa is a particularly important monastery for the Bon Buddhist, a distinctly Tibetan branch of the religion. This is all explained by Peter Matthiessen, who was a Buddhist. I can't pretend that I'm that interested in Buddhism but the visits to the Gumpas (the main one, the Shey Gumpa and the even more beautiful Tsakang further up the valley) were great fun. In contrast to religious buildings in Europe, these are living breathing places and have a disarmingly domestic feel to them. The Shey Gumpa was the biggest and normally has a 10 monk complement. The main event there is the annual pilgrimage, which takes place in August when additional more important monks from Kathmandu descend on the place. 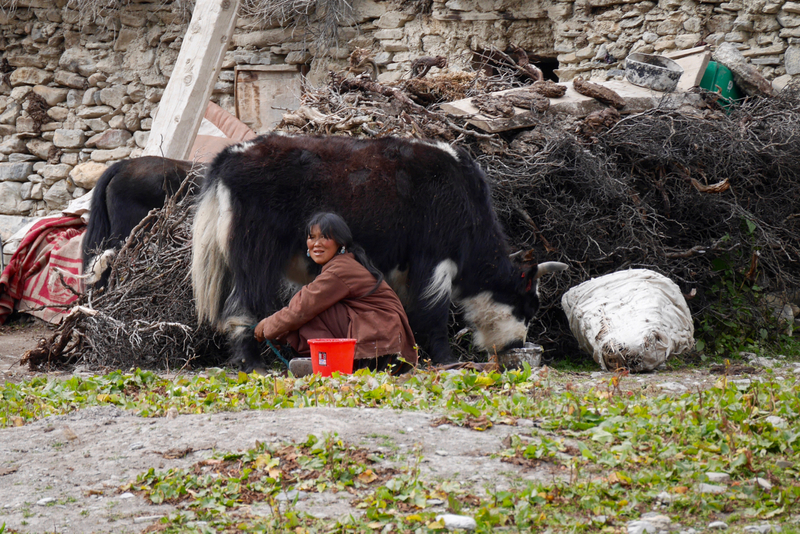 Already in early October, it felt cold and drafty and you'd need to burn a lot of the great pile of yak dung heaped up against the wall to keep it warm. I particularly liked the rosettes pinned up inside which had been worn by the no 1,2 and 3 important monks from August pilgrimage. They were exactly the same as the rosettes awarded to prize livestock at an agricultural show. Just below the monastery was a small campsite, the summer residence for the nomadic locals. Children were running around and yaks were being milked. Accommodation involved a mix of large square ex-military tents and more permanent stone buildings some with small solar panels and satellite dishes. 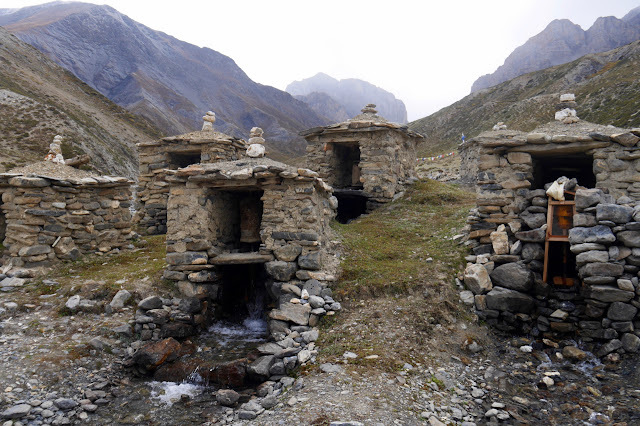 Particularly interesting were a series of beehive sized stone structures each accommodating prayer wheels which water, channelled through them, kept constantly turning. Also interesting was a man and his pony. 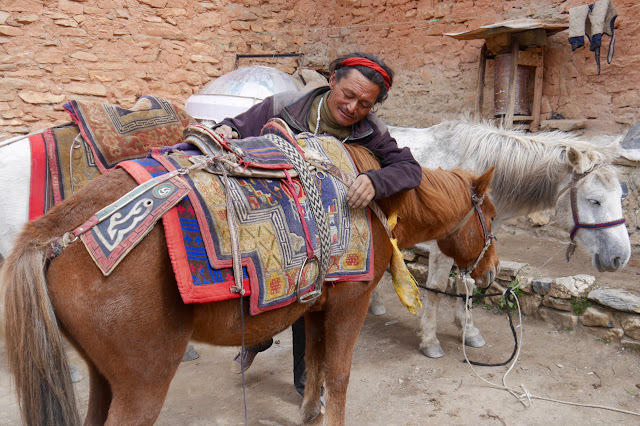 Christine is a bit nervous about tomorrow's return trip over the Kang La (a 1000m climb), so BB suggested hiring a pony. Now she can see that it could happen, her initial enthusiasm is starting to diminish. From Shey Gumpa we headed north up the valley and over a couple of ridges to the Tsakang Gumpa. Built into the side of the rock this was both more dramatic than Shey and even more intimate. 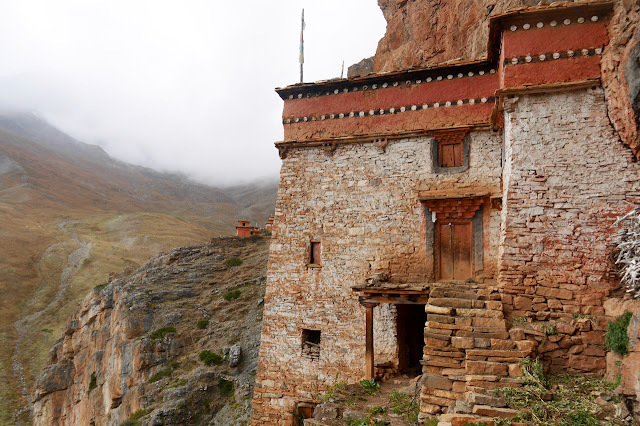 Only 2 monks lived there and the rooms were dark and tiny. On the stairs was a bucket for ablutions with associated instruments including a dangerous looking and very primitive razor. Adding to the weird reality of life in this cold dark place was a wet patch on the wall where the monk had relieved himself shortly before our arrival. Leaving the monastery we were offered some yak cheese. With the same texture and initially a similar flavour, its strong and very unpleasant after taste distinguished it from parmesan. 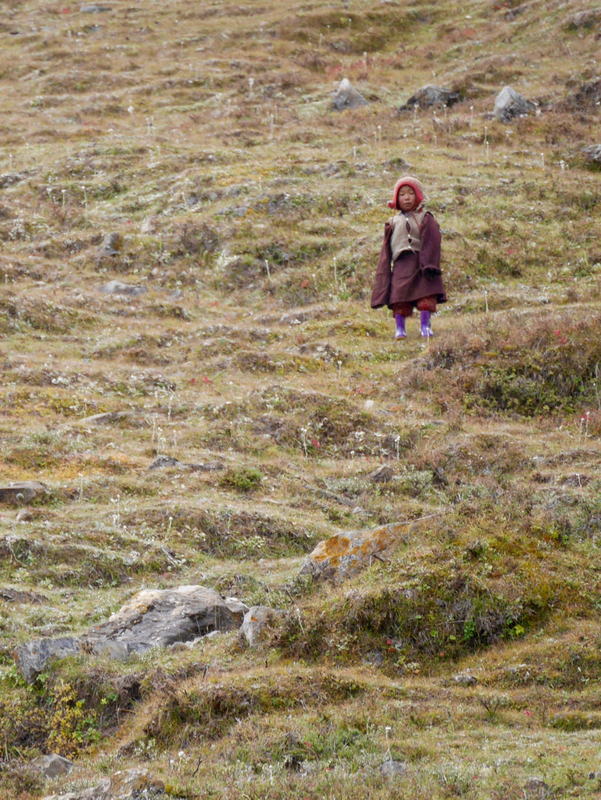 On the mountain side near Tsakang Gumpa, a mother and son were moving yaks. 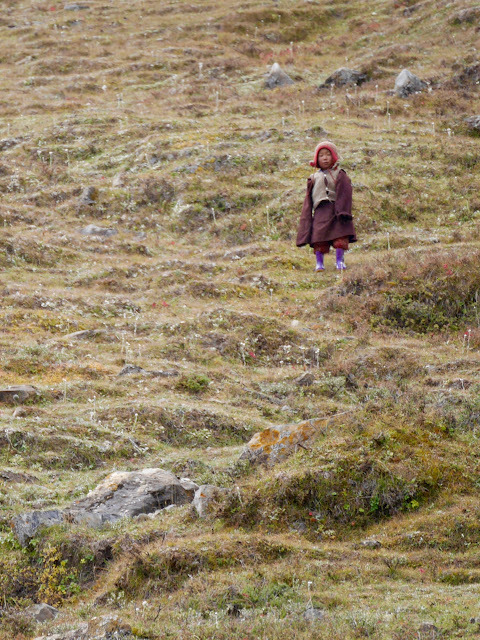 The boy, who looked no older than 4, was dressed in a long tunic with a big woollen Nepalese hat. 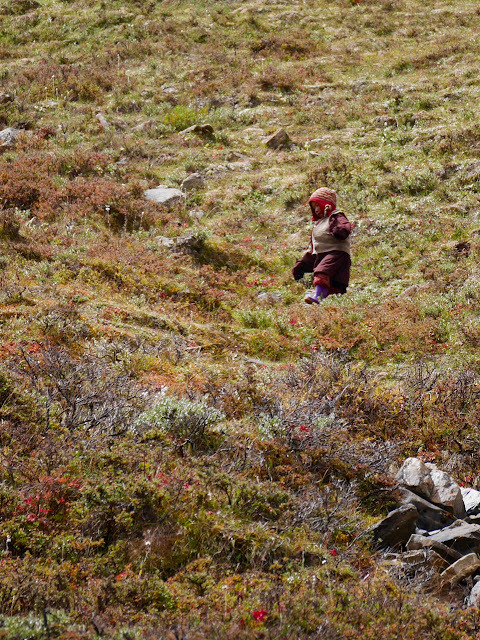 Running down the mountainside, throwing stones at the yaks, he looked just like an ewok but without the fur and the ears. He fell over frequently but with such a low centre of gravity he barely seemed to notice. I'm afraid we didn't see any of the famous blue sheep (I've seen them on other trips) nor did we see a snow leopard. 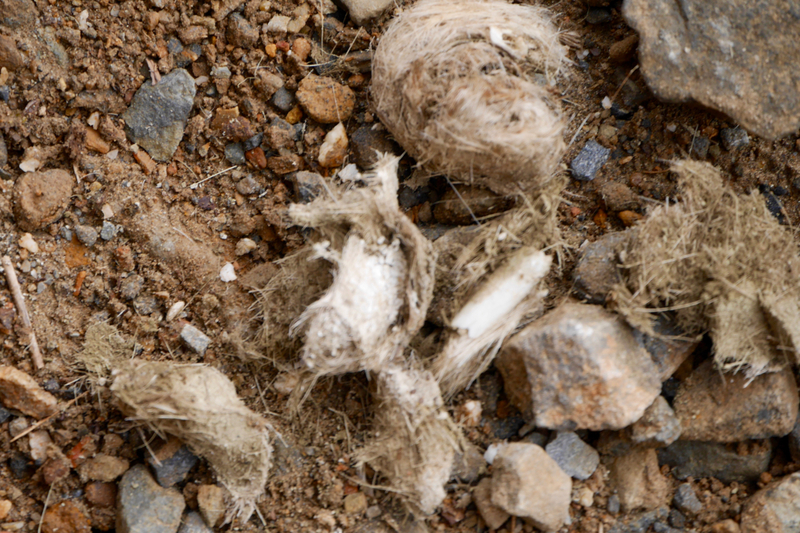 BB found some droppings near the Tsakang Gumpa containing a large and uncomfortable looking bone and said with great confidence that the droppings had passed through a snow leopard. I'm not entirely sure if BB is a droppings expert but we were happy to believe him. Today we had Shey Gumpa to ourselves. 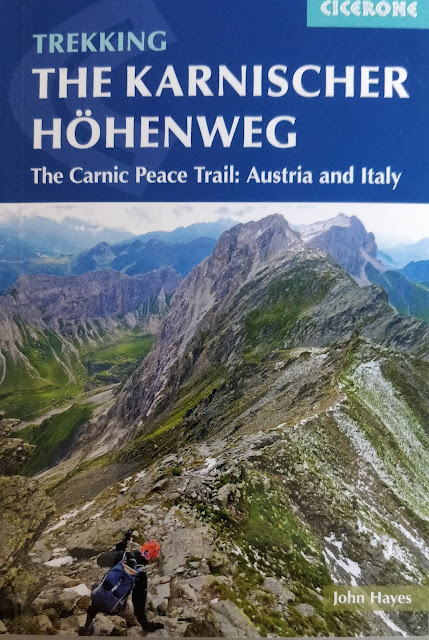 The French and Slovenian groups who had crossed the Kang La with us are both on longer circular routes so unlike us are not going over the same ground twice. We are starting to regret choosing a there and back itinerary even though I've enjoyed the extra day it's given us in Shey Gumpa.